Since moving to our new home in the Forest of Dean Gloucestershire, we have created a space reserved entirely for hobbies, shared between my husband and myself. 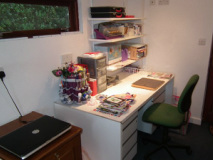 The photograph to the left shows my crafting area for cardmaking, but it's never as tidy as this! Take a look at some of my recent efforts, click here to see them. I enjoy decoupage, and embossing and die-cutting (having a Cuttlebug and a Grand Calibur) and have recently been introduced to "Flowersoft". Many of the cards shown are for sale, and I will take orders for occasions such as special birthdays, anniversaries, etc. Just email me by going to my Home Page above.